Do LEDs still cost too much? A bridge renovation project in Milwaukee spotlights the difficulties large public LED lighting projects can face. Bridges are evocative. They connect two often disparate places. A bridge may span something beautiful or something dangerous, or both at the same time. Bridges are gateways. They are major components of cities' skylines. They often come to be imbued with emotional freight, sometimes to symbolize the city or its aspirations. The Bay Lights project on the San Francisco-Oakland Bay Bridge, which we discussed last month, represents the high-concept end of the market for lighting bridges. Six million dollars is budgeted for designing, building, and running the city-scale art project for two years. The money is being raised privately. Most everyone in the city seems to love it (with the exception of a few who grumble that the lights face the rich side of the city, not the poor side). Buffalo, N.Y. has been nicknamed the City of Light for well over a century, as it was one of the first cities to be illuminated by hydro-electric power. The Peace Bridge, spanning the Niagara River between Buffalo and Fort Erie, Ontario, Canada, has been lit for much of its 88-year history. In 2009, the Buffalo and Fort Erie Public Bridge Authority spent $1.2 million to upgrade the bridge's lights to (again) LEDs supplied by Philips Color Kinetics. "The installation uses a combination of  ColorBlast Powercore LED wash lights and ColorReach Powercore LED floodlights," according to a feature on Philips's Color Kinetics website. I could not find any word of controversy about spending public money to update the Peace Bridge's lights. In this East Coast city, there doesn't seem to be community sentiment for making art of the city's bridges. But spotlighting architecture gets the city's vote. 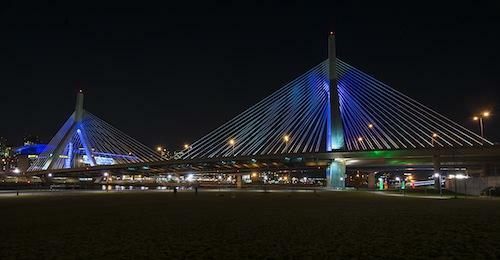 The Leonard P. Zakim Bunker Hill Bridge, only 10 years old now, was resplendent in violet light in its early years. In 2009 the Turnpike Authority, which ran the bridge at the time, was struggling under massive debt. The Authority grew weary of paying $5,000 per month for the electricity required by the halide lights that were originally installed on the Zakim Bridge, and turned the lights off. The bridge's architect, Miguel Rosales, sent a $15,000 check to the department to pay for 3 months' worth of juice. "It was always my idea to have lighting on the bridge," he said. Six months later, the state legislature voted the Turnpike Authority out of existence. And late last year its successor, the Mass. Department of Transportation, unveiled revamped lighting for the Zakim Bridge, at a cost of $150,000. Surprise -- they are finally using LEDs, from Philips Color Kinetics (sister company of this site's sponsor). The new lights are fully controllable remotely via Ethernet -- with the old halides, workers needed to close down a lane of traffic to swap out color filters. In Milwaukee, Wis., perhaps people are of a more pragmatic bent. After a long fight, the city finally put together the $278 million to reinforce and repaint the Hoan Bridge, a prominent Milwaukee landmark. 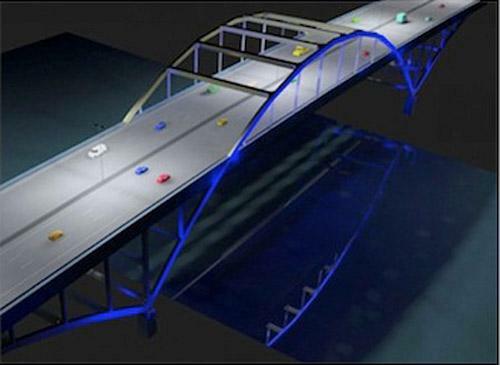 Wisconsin's Department of Transportation announced plans to install blue LED lights on the bridge's characteristic arch, at a cost of $750,000 to $1 million. (No illumination has decorated the bridge until now.) The plan immediately drew fire from state legislators. One expressed frustration that road safety projects in his district had been delayed by a shortage of funds at WisDOT. The jury is still out on the question of lighting up the Hoan Bridge, but I would not put money on its success. Installing LEDs represented a big savings in operating costs in Boston and Buffalo for bridges that had historically been illuminated. Milwaukee's bridge, by contrast, was a "greenfield" project, and that may be one reason it is encountering stiff headwinds. As LED prices continue to drop, these difficulties should ease over time.